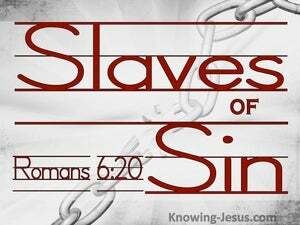 ﻿ Romans 6:20 For when you were slaves of sin, you were free in regard to righteousness. For when you were slaves of sin, you were free from allegiance to righteousness. 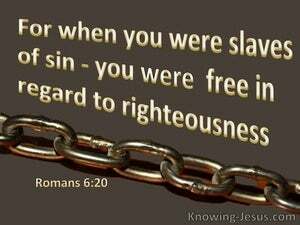 For when you were slaves of sin, you were "free" as far as righteousness was concerned. For when ye were bondmen of sin, ye were uninhibited by righteousness. For when ye were servants of sin, ye were free in regard of righteousness. For when you were [once] slaves to [the practice of] sin, you were free from [being controlled by] righteousness. For when you were the servants of sin, you were free with respect to righteousness. When you were servants of sin you were free from righteousness. for when ye were the vassals of sin, ye were not in the service of virtue. For when ye were bondmen of sin ye were free from righteousness. For when you were slaves of sin, you were free as far as uprightness was concerned. For being previously the slaves of sin, now ye have been made the slaves of righteousness. For when ye were servants to sin, ye were free to justice. For when you were slaves of sin, you were free with respect to righteousness. For when you were the slaves of sin, you were free from righteousness. For when ye were servants of sin, ye were not under righteousness. When you served sin, you were free of righteousness. 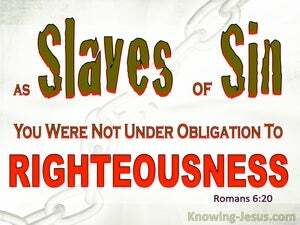 For when you were the slaves of sin, you were under no subjection to righteousness. For when you were servants of sin, you were free in regard to righteousness. For when ye were the slaves of sin, ye were not the bondmen of righteousness. For when you were servants of sin, you were free from righteousness. For when ye were the slaves of sin, ye were free from righteousness. While you were still servants of Sin, you were free as regards Righteousness. For when you were the bondservants of sin, you were under no sort of subjection to Righteousness. For when you were slaves of sin, you were free so far as doing right was concerned. For, when ye were slaves of sin, ye were free as to righteousness. For when ye were servants of sin, ye were free from righteousness. 19 I am speaking in human terms because of the weakness of your flesh For just as you presented your members as slaves to impurity and to lawlessness, resulting in further lawlessness, so now present your members as slaves to righteousness, resulting in sanctification. 20 For when you were slaves of sin, you were free in regard to righteousness. 21 Therefore what benefit were you then deriving from the things of which you are now ashamed? For the outcome of those things is death.